» Admission is $30 and all the paintings are fakes – so why is the Otsuka Museum of Art so popular? The museum, which is located near the Naruto Straight in Tokushima-ken, was founded by Otsuka Pharmaceutical in 1998 – the company that brought the world Pocari Sweat and Calorie Mate. 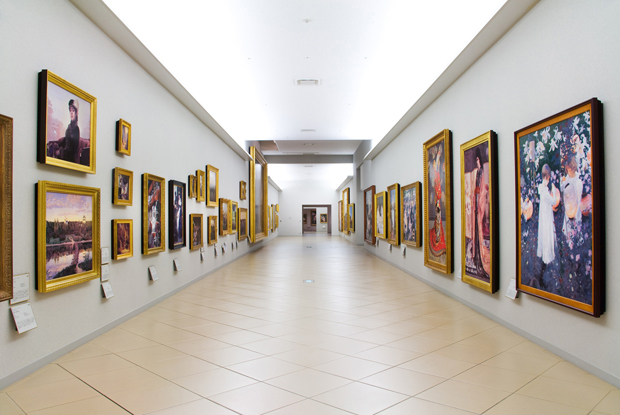 It contains more than 1,000 masterpieces of Western art, all of them reproduced onto ceramic boards. As well as replicas of an enormous range of paintings including the complete works of Leonardo da Vinci and all of Rembrandt’s self-portraits, the museum is also home to large-scale reproductions including the interior of the Sistine Chapel and a long-lost El Greco altarpiece. ▼ Possibly contains even more Japanese tourists than the actual Sistine Chapel. Like those copies of entire cities that appear suddenly in China, it’s easy to laugh at this “museum of fakes”. But leaving aside the difference between making replica prints with permission, and breaking architectural copyright, the Otsuka Museum of Art fills the same gap in the market as China’s fake Manhattans and little Venices do: it provides an affordable alternative to travelling abroad to see the originals. Huge collections of Western art don’t come on tour to Japan: even the relatively large-scale Louvre exhibition coming to Tokyo next year is only 70 pieces. Compared to that, a permanent collection housing 1,000 pieces of Western art – from 25 different countries, no less – starts to sound pretty amazing, even if they are replicas. The original version of Picasso’s ‘Geurnica’ is too delicate to be moved; the El Greco altarpiece ‘Doña María de Aragón’, is split between Madrid and Bucharest. ▼ ‘El Replico’ (they don’t call it that, but they should). The museum actually attempts to provide a visitor experience that is better than the real thing, freeing visitors from the restrictions that conventional museums have to apply to protect artworks from damage. Photography is allowed in all parts of the Otsuka galleries, and there are no ropes or wires to stand behind. You can stand as close to the replica paintings as you want, and even touch them. Otsuka’s museum directors see their porcelain replicas as capturing a moment in history: they form a permanent record of the condition these works were in at the turn of the millennium. While the original artworks, scattered around the globe, will continue to fade and deteriorate, the ceramic prints in Tokushima are intended to last for at least another 2,000 years.